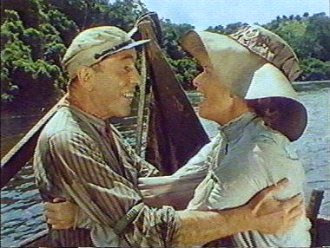 Bookride: The African Queen. C.S. Forester, 1935. I have started to break up the paragraphs a bit more, rather than have indigestible blocks of prose, and I have even gone back and redone a few. E.g. Heminway and Wyndham Lewis. This is at at the suggestion of Seth from Honolulu - Aloha and thanks. In the book game there comes a point when you have to get out a pencil and start pricing books, so time for fun is limited. Some slightly shorter blogs coming up as I prepare to tackle a few hundred boxes of rather good books that just got delivered in a large van. 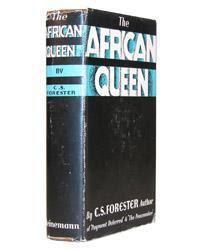 Today it is Forester's most valuable book, but not his most rare in jacket - e.g. you don't see Pawn Among Kings or Two and Twenty very much, let alone Love Lies Dreaming, The Shadow of the Hawk (rarissimo) or his first book The Paid Piper. C.S. Forester. THE AFRICAN QUEEN. Heinemann, London 1935. Oddly enough the American and English editions have different endings - look away now if you don't want to know - in the English edition, the Royal Navy sinks the Konigin Luise, and Rose and Allnutt survive to marry; in the American edition, they fail to sink the ship with the African Queen's torpedo, and Allnutt disappears beneath the waves. One dealer has a US first inscribed in February 1935 and suggests the American edition may precede. VALUE? Stonking valuable book, 2 copies on web of the UK first at well north of £10K although how many punters there are at that dizzy level is unknowable. At this price one has to be extremely keen on CSF, or possibly a cultish devotee of the movie, and possessed of a spare £10K so the customer pool is likely to be small.